On June 4, 1998, the very first Beerkada strip was published in The Philippine Star. I’m very happy that I’m still doing what I love after two decades. 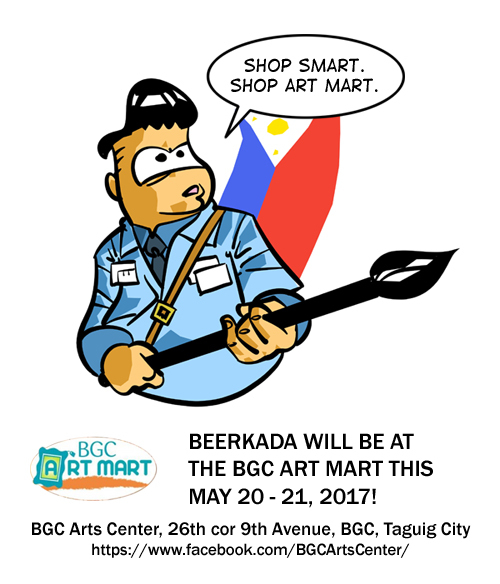 Thanks to The Philippine Star for continuing to publish Beerkada and every Beerkadet out there for supporting my work since the late 90’s. 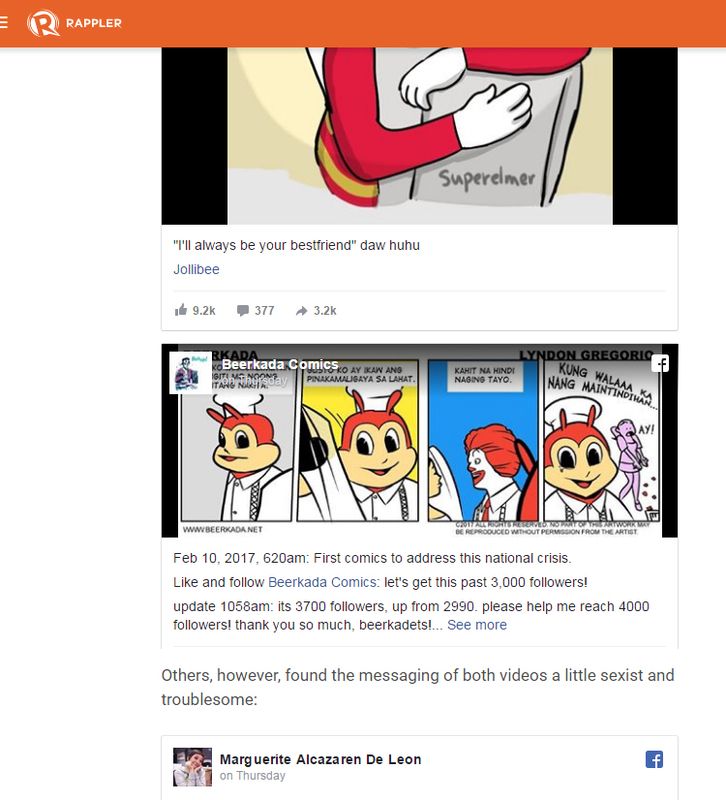 It started with Vow, one of Jollibee’s Valentine’s Day 2017 commercials. People were already having an unusual reaction to it across the Internet. I thought that if I was going to address the commercial, I would be straightforward: very little irony and references. Replacing the lead and the groom with fast food mascots were very obvious choices. I usually wake up at 4am nowadays, as it is the only time I can draw before I help out my pregnant wife througout the day. 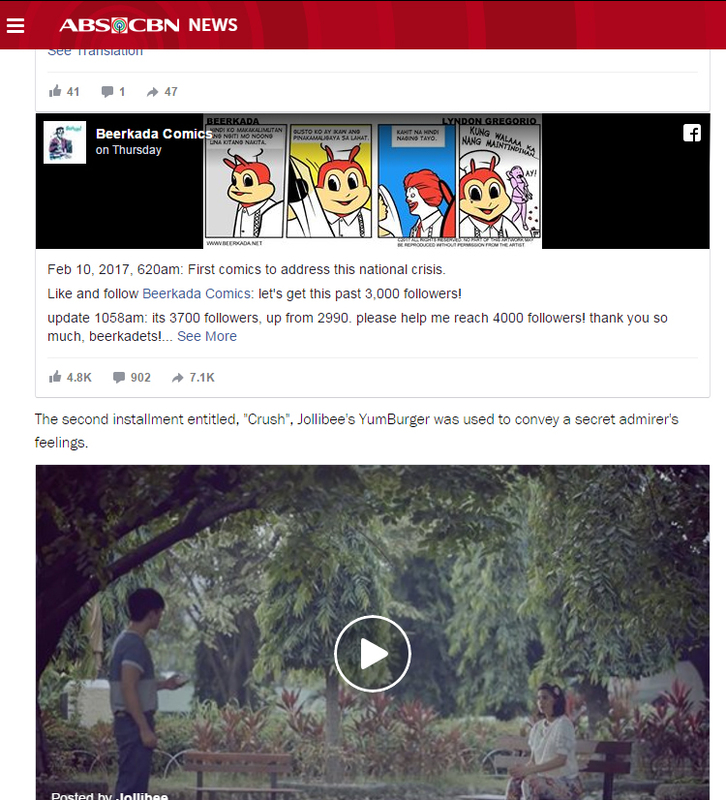 I check my FB before rising up, and discover my page feed is filled with Jollibee posts. That’s when I knew that this was a major trend. However, my idea for the strip was obvious, and could be thought up by anyone. I decided to draw it first and own the concept. I even put a timestamp on the end product for documentation purposes. I reached 63,425 people after 3 hours, when my top reach before was 35,000. I decided to track the metrics every half hour. When my followers went past 3,000, I openly appealed to readers to follow my page. 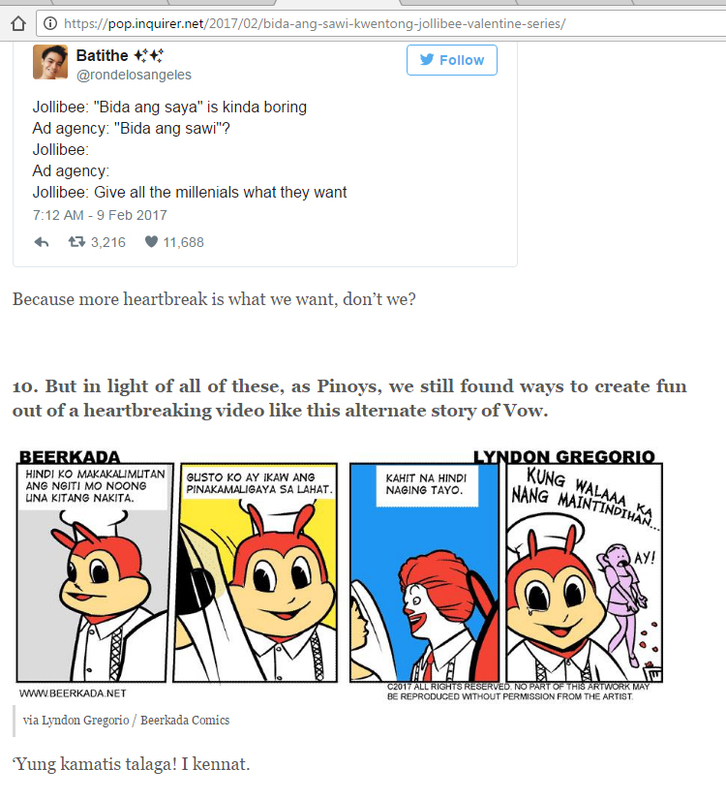 By evening, major news websites were including my strip among the top memes based on Vow. 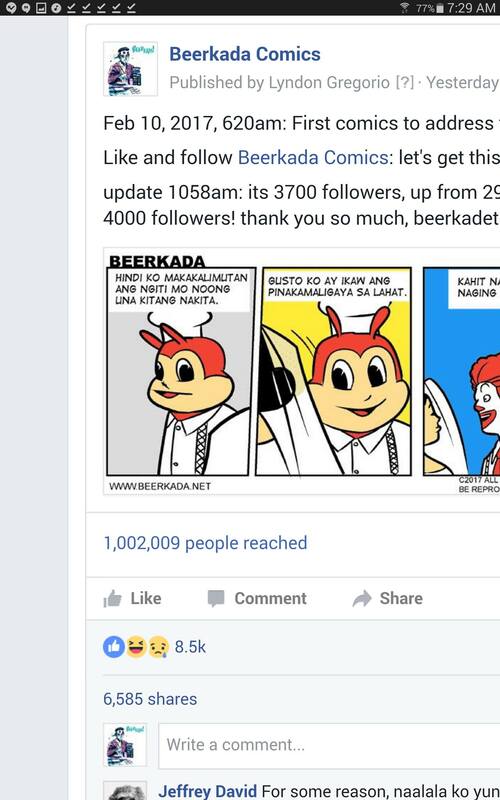 And after 24 hours, my strip has reached over a million people. And in all this time, FB is suggesting I spend P120 to boost my reach by 1,500 people. In the end, I doubled my page followers to 6k+, and its still rising. 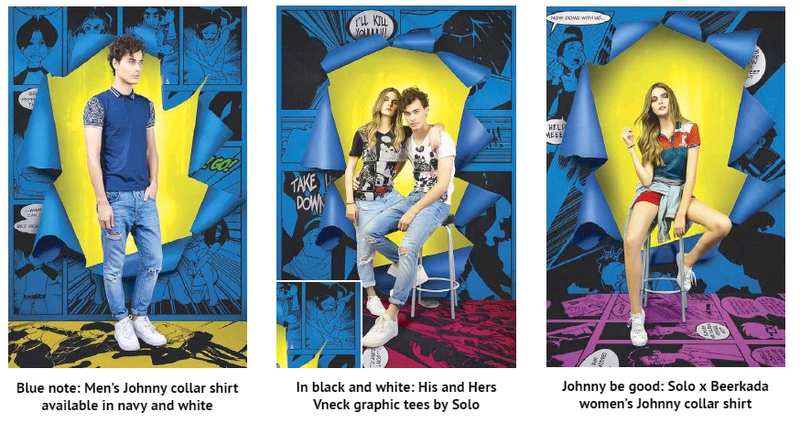 The Solo brand has chosen Beerkada to be its next featured comics in its limited run fashion collection! You can buy these apparel at any Solo branch or online at www.solo.com.ph. Thanks to Ms Sheree for the honor.